Mods can greatly expand and enhance your gaming experience. 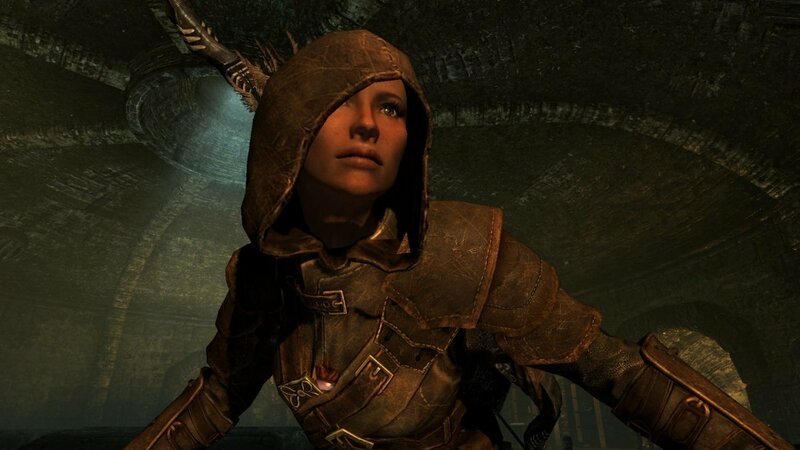 Games such as the Elder Scrolls games, Skyrim, Morrowind, Oblivion and as well as Fallout New Vegas,Fallout 3, Dragon age and Mount and Blade have literally thousands of mods that change, update and enhance almost every part of the game. 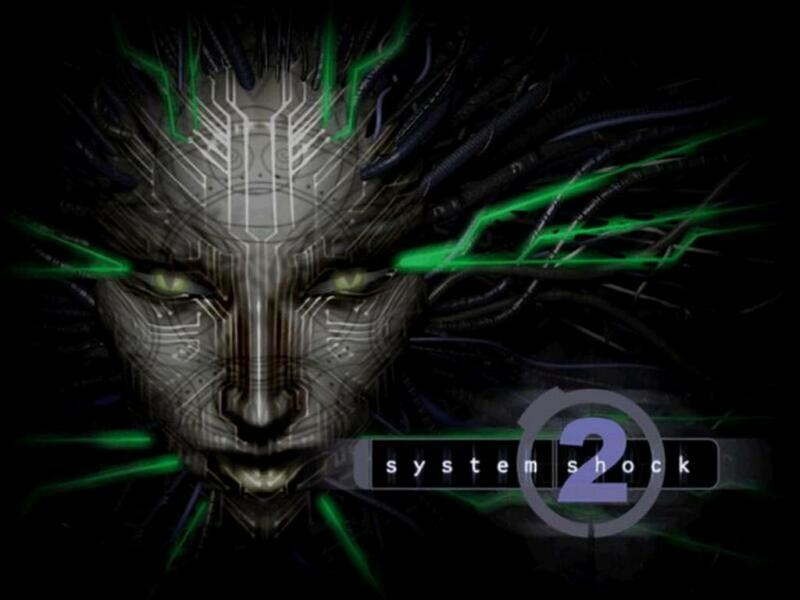 These mods have been written by fans of the games themselves and using them, the games graphics can be upgraded using higher resolution texture packs, game play can be changed and the game world itself can be extended, improved and updated. In addition, mods can add replayability through new quests and landmasses and allow you to play the game in ways the games authors could scarcely have imagined. 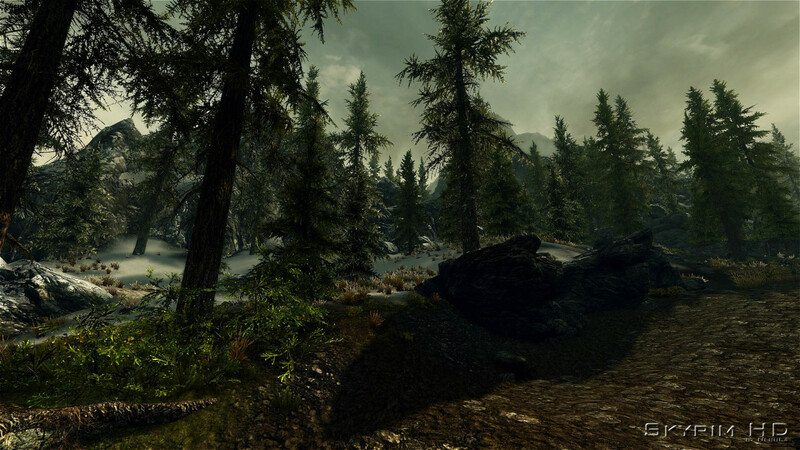 Screenshot of Skyrim with the Skyrim HD mod installed. Courtesy of Skyrim Nexus and NebuLa the mod author and of course Bethesda. 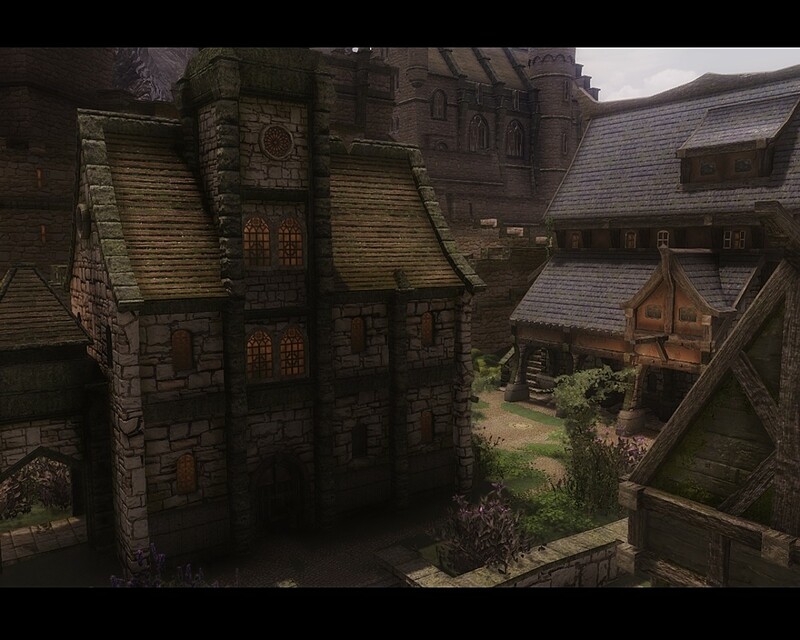 Screenshot of Skyrim with the Tamriel Reloaded - Textures and Parallax mod installed. 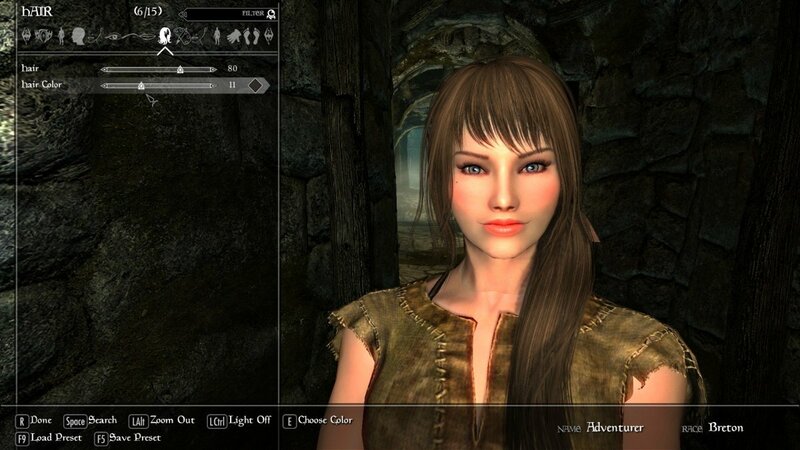 Courtesy of Skyrim Nexus and 32cm the mod author and of course Bethesda. First, download the executable file from www.nexusmods.com. The initial installation is very straight forward. Nexus Mode Manager first scans your computer for games that it supports. Now we have confirmed which games are installed and that we want Nexus Mod Manager to manage out mods, we will receive a summary screen of the games we have selected. 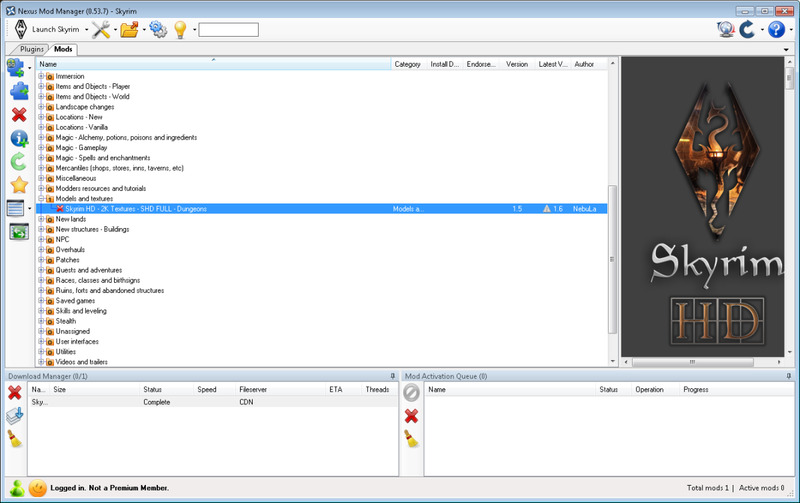 Screen showing the games available and allowing you to select which game you would like to manage using Nexus Mod Manager. Confirm the location of your mods on your computer if you have any downloaded. If you are using Nexus Mod Manager to manage your Skyrim mods and have not yet launched Skyrim, you will receive the below warning. 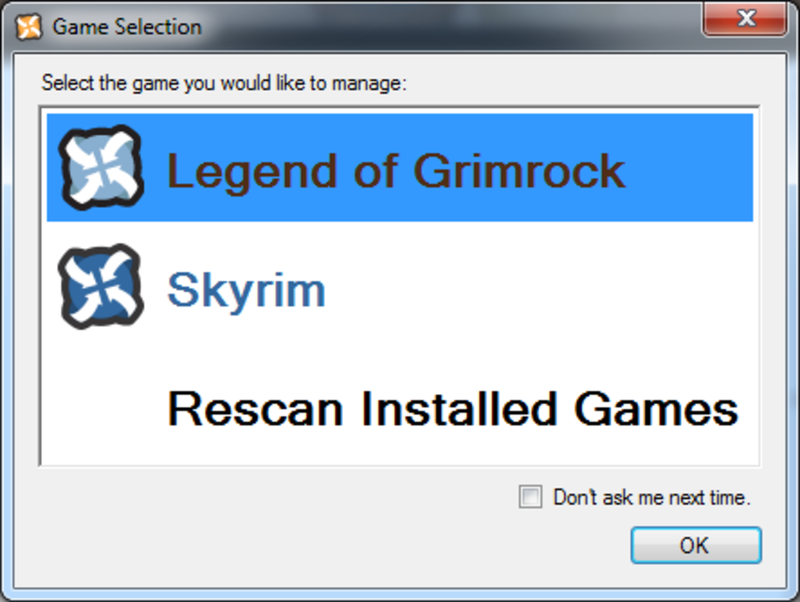 Click OK and run the Skyrim to clear the error. If you are running Windows Vista or Windows 7, you may receive the following error as well. 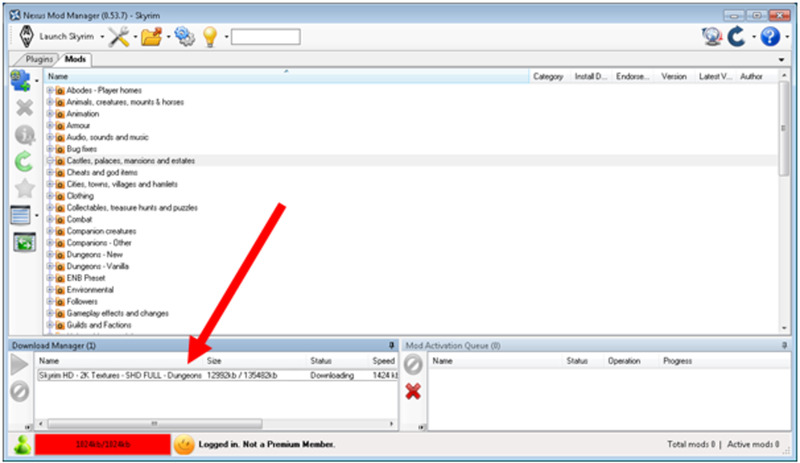 Permissions error often seen for Windows Vista and Windows 7 users installing Nexus Mod Manager. 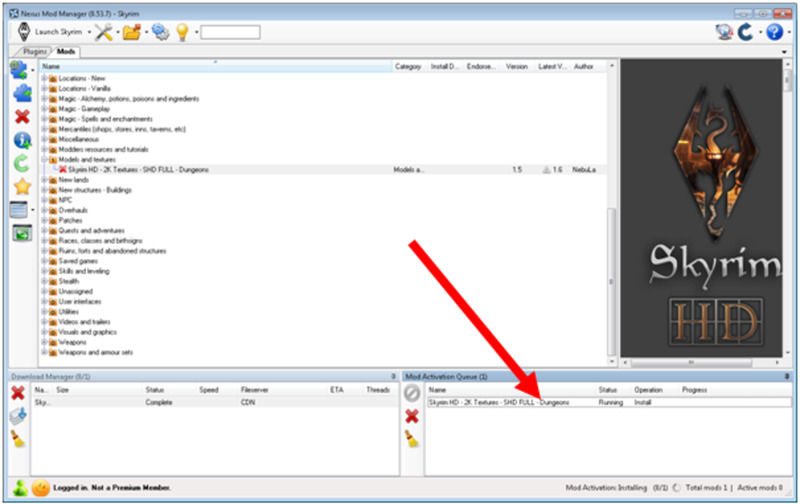 Configure Nexus Mod Manager to run as the Administrator. 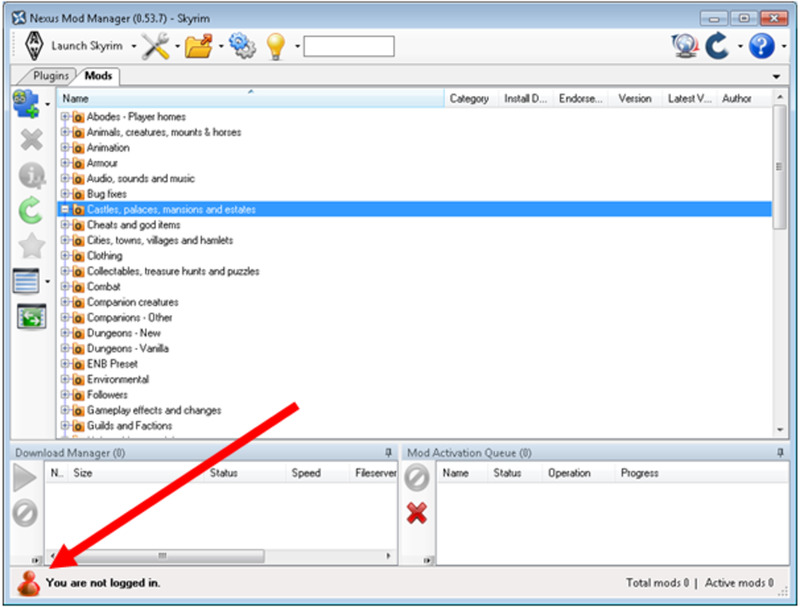 Click Yes, to allow Nexus Mod Manager to sort your mods using predefined categories. 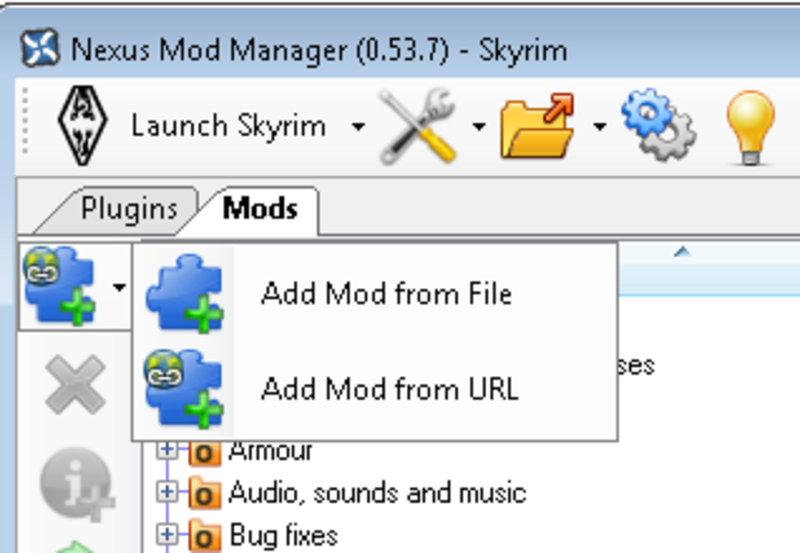 Log into your Nexus account to enable you to download mods using Nexus Mod Manager. Once you have logged in, the icon that was orange will now become green and you are ready to download mods for your chosen game. Now that you are logged into Nexus Mod Manager, you are ready to download and also update the mods for your chosen game. Now the application is fully configured we can begin to add some mods to our games. 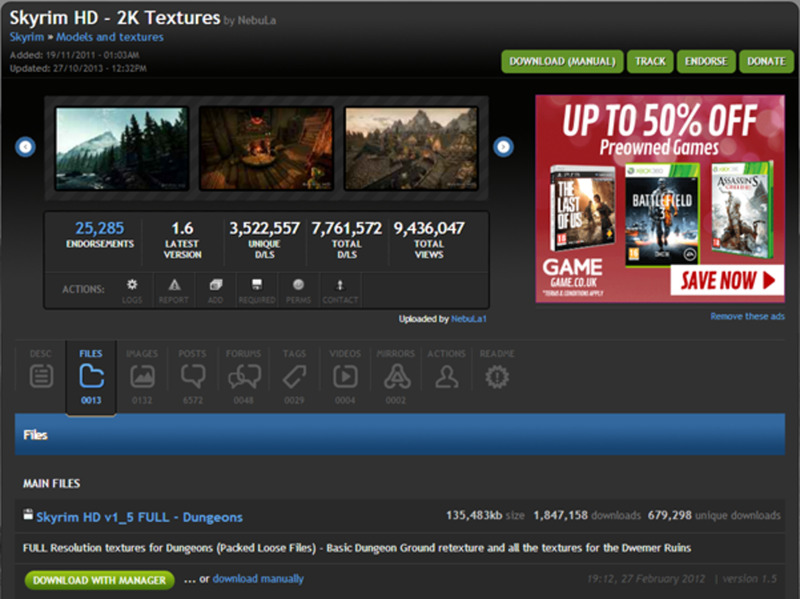 You can see the categories below, all with zeros as we have no mods currently downloaded. 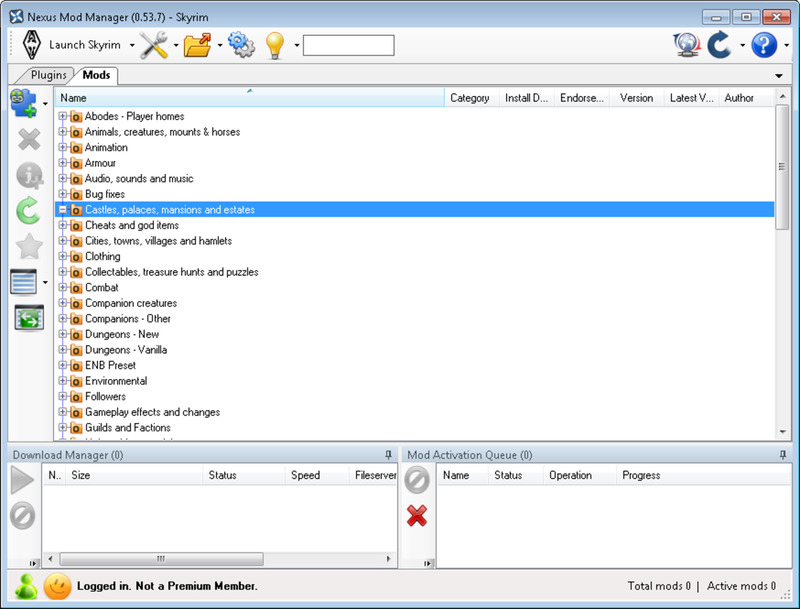 Nexus Mod Manager showing the predefined mod categories. Showing both methods you can use to add mods using Nexus Mod Manager. Choosing a mod to install from the Nexus website. You can see the mod downloading at the bottom left of the application. Nexus Mod Manager's Download Manager downloading a mod. You will now see that the Category Models and textures has a 1 rather than a 0. 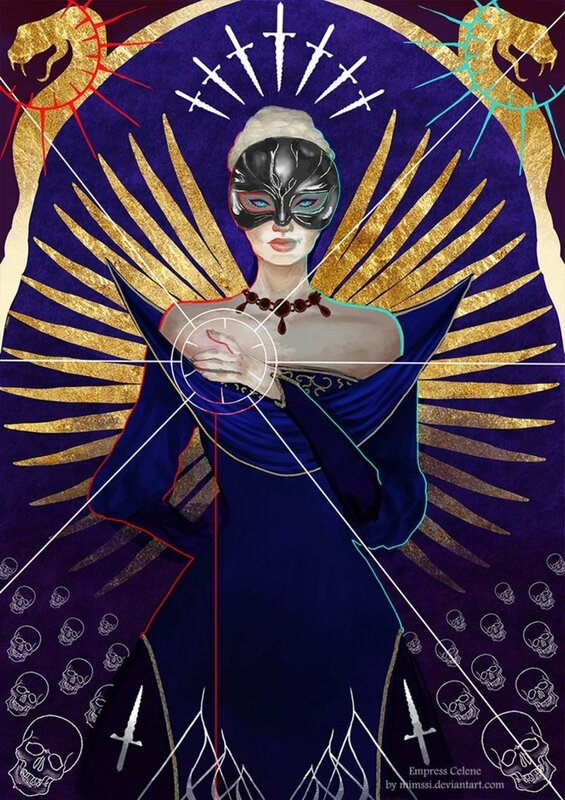 If we expand the folder we can see our new mod. 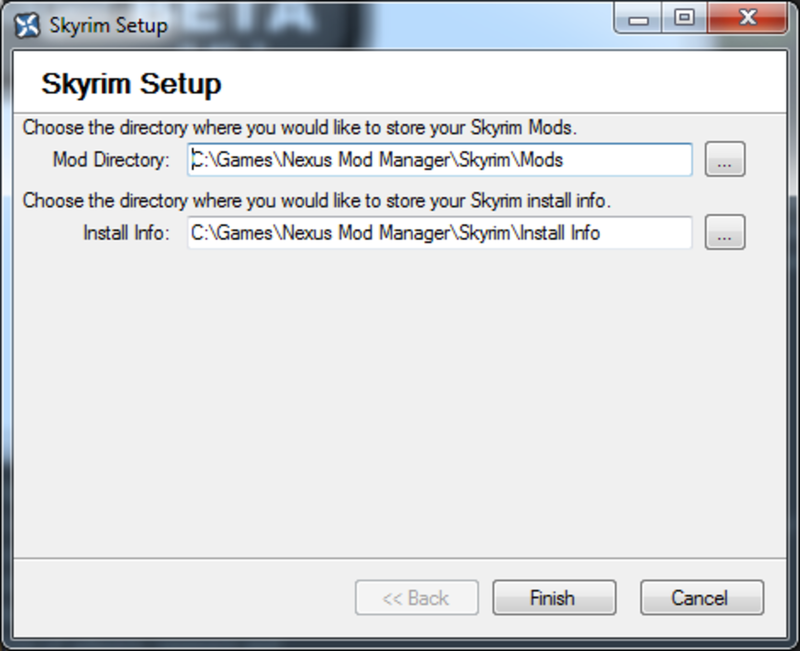 Our newly downloaded Skyrim mod is ready to install in Nexus Mod Manager. On the right hand side, you can see the mods instruction file. Scroll down and check the installation instructions. You should read this before proceeding to make sure that it doesn't need other mods to run correctly. This mod hasn't got any special instructions so we can install it without taking any further action. Note: Nexus Mod Manager will take care of copying any files, you just need to check for mods it may require or any mods it will conflict with. 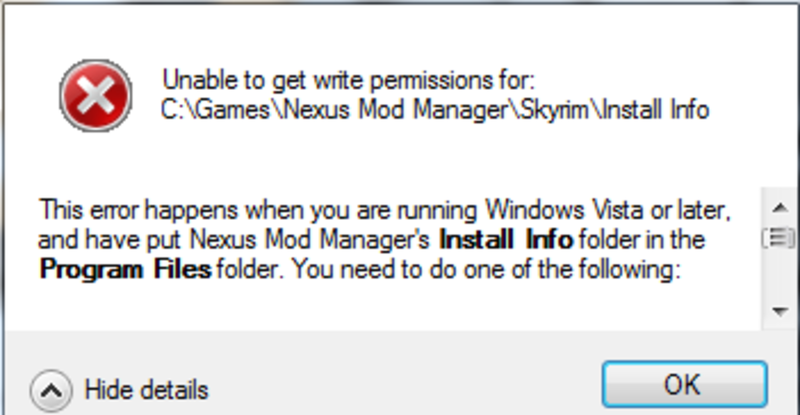 Installation instructions of the mod we downloaded using Nexus Mod Manager. Should the mod be missing a prerequisite mod (or mods), you will get a warning similar to the below. Download and install the missing mod and then click Install. Example of an error received when installing a mod that is missing a prerequisite mod. 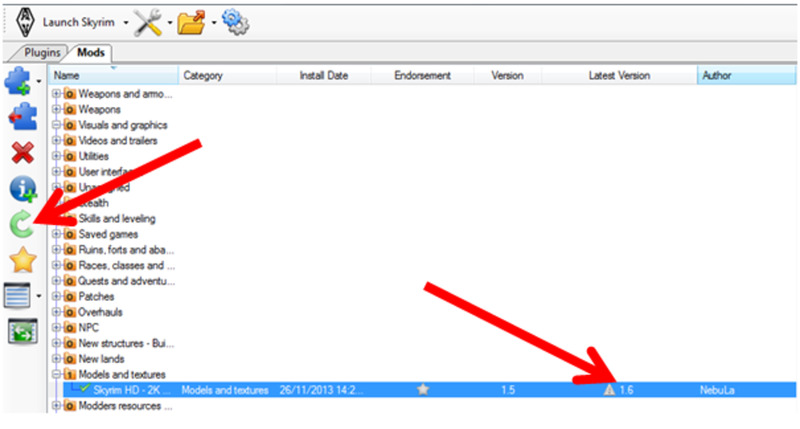 The Mod Activation Queue pane in Nexus Mod Manager shows you the installation progress of your mod. This is advising you that mod is going to overwrite some files in your installation. The best way to approach installing mods is to work with general texture replacers first. As we are replacing all textures with new high resolution ones, I will select Yes to all. Choose whether your newly installed mod will overwrite existing files or not. Now we get to use one of the most useful features that Nexus Mod Manager can help us with. You can see from the screen shot that we are running version 1.5 of this mod and there is a new version (1.6) available. There are two ways to update your mod. The second is to click the link in the Latest Version column for that mod. How to update mods automatically using Nexus Mod Manager. Once you have downloaded the new version, Deactivate the old mod and Activate the new one. At the same time, delete the 1.5 version using the big red cross icon. The next tab we will look at is the Plugins tab. Many mods come with .esp or plugin files. These make changes to the game world such as adding new land masses, changing lighting, adding new clothes or races and so on. Skyrim and other games load these in an order specified by the load order. 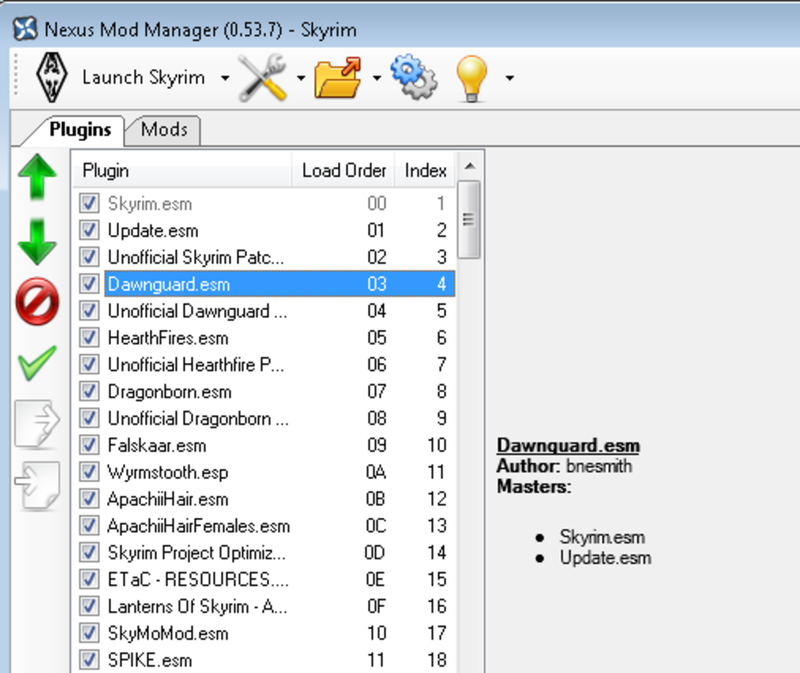 Many mods require a specific load order and Nexus Mod Manager will organise this for you. Despite this, you may wish to change the order if a mod advised you to do so and for some reason Nexus Mod Manager does not reflect this. 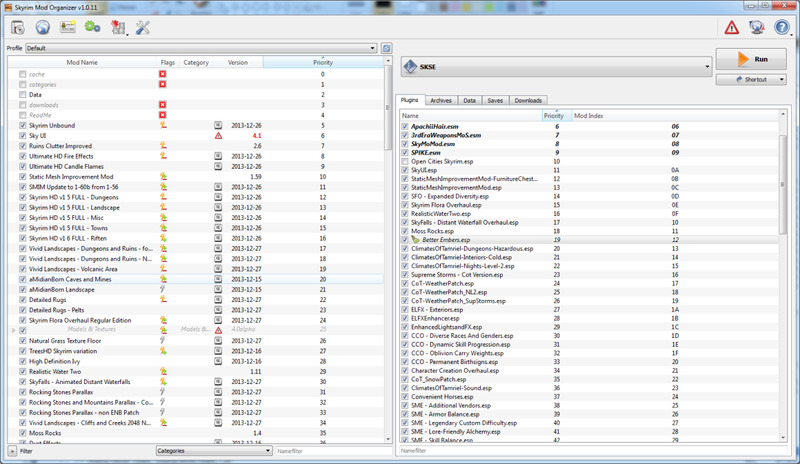 You can see from the picture below, I have a load order configured for my Skyrim mods created by the Mod Manager. How to manage the plugin load order using Nexus Mod Manager. Note: Only move a plugin if you have a valid reason to do so. If you make changes to a load order without fully understanding exactly what you are doing, you could cause some of the plugins to fail to work, or worse Skyrim or whichever game it is that you are configuring could fail to work. Adding mods can take a game that you already love and enhance it in ways that you never imagined possible. 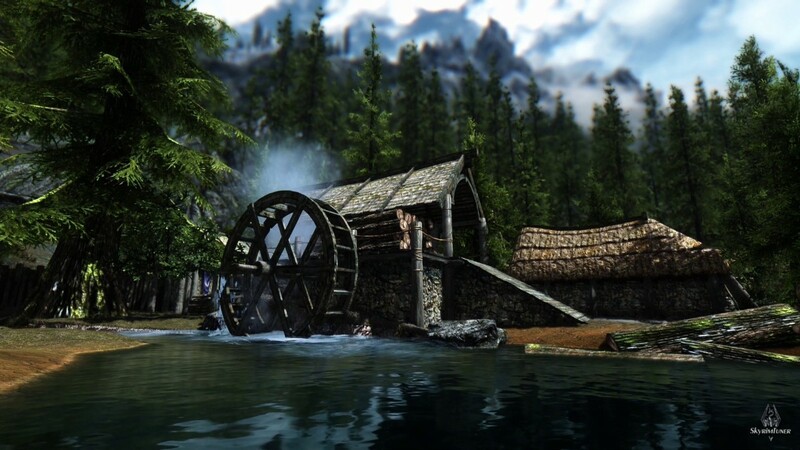 Mods are written by a games passionate fans with some mods having taken years to put together. You can have add up to date high resolution graphics, extra quests and places to explore, in fact games such as the Elder Scrolls Series (Morrowind, Oblivion and Skyrim) have thousands of mods available to choose from. I hope that you have found this hub useful. For me, mods are what takes a great game and makes it everything it could be and more. Nexus Mod Manager is a great tool to make this complicated process simpler. Please feel free to leave a comment below and happy gaming! Thank you for this post, ive been running mods for fallout 4 on my xbox 1X for awhile now. Now im going to start playing on pc and had no idea how this worked. I download these mods through the mod loader, instead of manually, how do I activate the mods? Finally started playing Skyrim, better late than never. After seeing all the potential of the mods, I can't wait to start modding, and your guide made the process very straightforward. Thank you so much! I realize this article is super old, but I'm super old school so I'm just getting around to doing this sort of stuff now. Thank you so much for taking your time to help out supernoobs like myself. It's very appreciated! please please help me! I uninstalled a mod via nmm since i wanted to change the mod options while reinstalling the mod, but somehow the mod just installs itself without all the options i had first time installing. 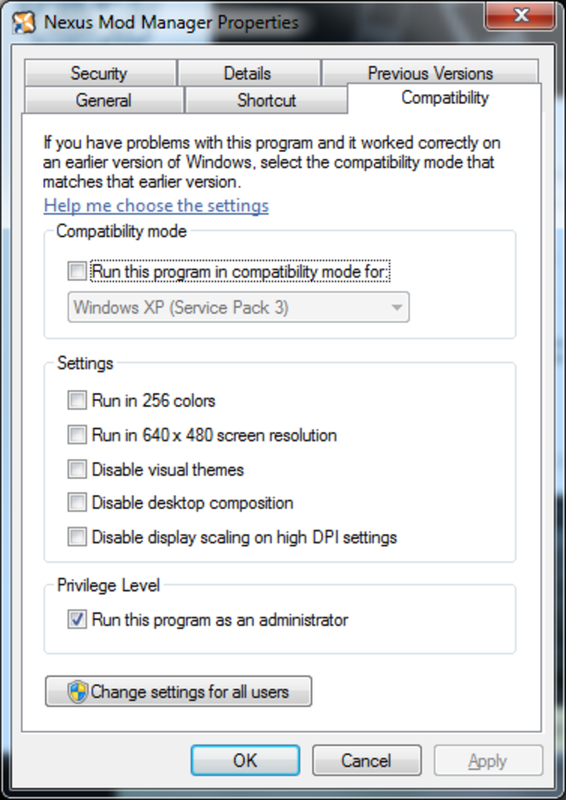 Is there a way to actually get back to the installing options or am i doomed to live with it? Thanks Orpheus, glad you found my hub so useful and like the screenshots. Thank you for the detailed guide, screens helps a lot! Thanks for your kind comment, I am so glad that you found my guide helpful. hey, thanks for this useful guide!